Quality extra long jeans and clothing for tall men; offering advice on the best brands and where to find them since 2009. Before you rush out in a burst of enthusiasm to buy online some of the great clothes for tall men featured in this blog, it's worth making sure you know what size and style really work for you. Working out what size you are is relatively straightforward. Finding clothes that are a perfect fit may not be. The first and easiest is to take the measurements from a set of clothes that fits you really well - but there's a catch. When I tried this, I was surprised how different the measurements were on the clothes I wear everyday (even on two pairs of 34x36 jeans!). If you do use this method, make sure that you use clothes that you are really comfortable with - standing up, sitting down, bending over and reaching up. Look for points where the clothes stretch, or where the material creases or bunches up, as this may indicate the clothes aren't such a great fit after all. It's also helpful to have a friend or partner on hand to help with the measurements and give a second opinion. The second is to take the measurements from you, not your clothes. Since this is best done wearing underwear that is not loose, choose any helper carefully! The inseam, or inside leg, should be measured from the lowest part of the crotch to where the trousers will end (generally just below your ankle, which for a tall person, will be be an inch or two from the floor). To measure this on a pair of trousers, measure along the inside seam of the leg from the bottom to where the two legs join at the crotch. Your waist is the point of the natural indentation in your width, typically at the level of your belly button. Sometimes trousers are worn a little lower, just above the hip bones. Measure the waistline while you stand relaxed (breathing in will result in a more flattering measurement but a worse clothing choice!). Measure without pulling the tape measure tight. This is the distance from the bottom of the crotch to the waistline. The front and back rise of trousers are sometimes different (Levi's 501s are an example) so you may wish to measure both. Measure from where the crotch of the trousers will be to where the top of the trousers will rest. This one should be measured around the widest part of the hips and buttocks. Some online stores give these measurements, but for most people this measurement is not used very much. Measure around your neck at the level where a shirt collar would lie. Ensure that the tape measure rests only gently against your neck. Measure from the bottom of your neck along your shoulder and all the way down your arm to the first joint of your thumb (just where your thumb separates from the rest of your hand). Measure across the widest part of your chest, typically just below your armpits. For a shirt or top (not a suit) measure from the first bone at the top of your back that you can feel easily down to the line where you measured your waistline. I am always amazed that so many stores do not give this measurement for their T shirts, polo shirts or dress shirts. For me this is one of the most important measurements, because it determines whether my shirt will come untucked or rise up above my trousers. If you wear pants (especially jeans) with a low rise so that they sit lower, this will be even more important, especially if you have a long body relative to your legs. Lay out a pair of trousers so that the bottom of one leg lies completely flat. Measure the width of the trousers along the bottom edge, and multiply this measurement by 2 to get the bottom opening. This gives a good indication of how loosely fitting trousers are - if you are tall, you may find slim trousers make you look thinner, so a very narrow opening may be something to avoid. You can go even further than this and take measurements for thigh, knee, etc. But unless you are going for a fully customised bespoke piece of clothing, its very unlikely that you'll need these. A nice guide to taking these measurements that includes pictures may be found here at the site of 'A Tailored Suit' which produces bespoke suits. Armed with this information, you will be able to choose clothes much more accurately . . . as long as you can get hold of the exact measurements of the item you want to buy. Some retailers are very good at sharing this information on their web site, for example Boden USA. With other retailers, it's difficult even to find trouser length, never mind rise. However, once you know what you need, an email to the customer service department will often get you the information you need within 24 hours - and if it doesn't, ask yourself whether you want to spend your money in a shop that doesn't take the needs of tall people seriously! Good style cannot be measured quite so easily as good fit! However, there are some guidelines that can definitely help tall men to select clothes that will work well with their proportions. 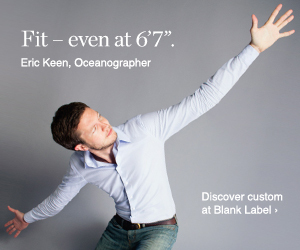 Typically, this means emphasising width so as to give the appearance of more 'average' proportions (please note: average proportions does not mean that looking average is the goal, but you want the phrase 'tall and elegant' to spring to people's minds when they see you, rather than 'bean pole'!). Your overall profile, or silhouette, is an obvious but important factor. A very tight, clinging outfit will make you look thinner and therefore emphasise height. In my opinion, a tight outfit offers the potential for fashion disaster whatever your height, but if you are tall, people may well think you just can't find a proper fit. However, excessively baggy or padded clothing, while it can provide extra width, can look scruffy and a sign that you've just used a size that's too big. Better just to go for something that fits well without being too tight. The best option is to use full, soft fabrics that will 'drape' well to work with your body shape. Layering clothes (e.g. a shirt plus a suit, or a top plus a sweater) can provide some extra volume and also breaks up your profile, which helps. Wool, whether trousers or knitwear, tends to work well to follow your shape without looking baggy or forming strange creases. Stiff cotton, canvas or denim can hang awkwardly and look baggy or stiff. Look out for softer versions of these fabrics that move more freely and fit well. A continuous stretch of one shade will emphasise length (height). If you don't want to stress your height then wear different colours top and bottom. You should also aim to get a good balance between the length of your torso and legs so that they are in proportion - if your torso is especially long, then avoid trousers with a low waistline. Wearing different colours is easily done with less formal outfits where trousers and a T-shirt, shirt or jacket can be of contrasting colours. In the case of a suit, where the jacket and trousers are always the same colour, a patterned tie or a belt can provide a bit of variety, or maybe even a pocket handkerchief if you are really dressing to impress! Vertical stripes will emphasise height, whereas plain colours and checks will not. Horizontal stripes will emphasise width, so these are a great casual option for T shirts and polo shirts. Formal shirts are uncommon in horizontal stripes, but any additional detailing such as a pocket, logo or monogram will break up an expanse of plain colour. The same principle applies to texture generally - this kind of detailing will break up the rise of your clothes and can reduce the appearance of height. You could consider jeans with distress marks or bold pocket detail, and also sweater or T-shirts with patterns or detailing, especially if it includes horizontal elements (e.g. stripes, diagonals). With suits, I've heard it said that a double breasted suit works well to increase the appearance of width on a taller man. I just don't happen to like them, but don't that let me stop you trying it! Choosing a traditional three-button suit rather than a two-button or one-button suit can also de-emphasise height, although at the moment two button suits are very popular. As well as thinking about colour and pattern, consider length and style when choosing tops. A collar will cover a longer neck and break up the vertical line of the body. Formal shirts with wider, cut back collars can help (typical in British styles rather than long, thin button down collars often seen on US shirts) as can casual shirts with a collar such as polo shirts. Tops should fit well around the shoulders and chest to get the basic width right. If shirts tend to fit well at the top but still look baggy around the waist, consider a slim fit which is often available for both formal and polo shirts. If not tucked into trousers, tops should end comfortably below the top of the trousers and avoid showing a gaping length of back if you bend over forwards. Overall, consider your profile and outfit. Looser fitting (not baggy!) trousers in shades that are not too strong or dark will reduce the impact of your height. Pleated trousers break up the shape and can create an impression of being wider and less tall, although at present, pleats are generally restricted to smarter workwear. For casual trousers in denim or thicker cotton (e.g. chinos), a wider opening at the bottom (e.g. 'boot cut' styles) can also provide more width and disguise very large feet. However, with very soft fabrics like fine wool suits, a straight cut coupled with narrow calves can result in fabric flapping around when you walk, making the trousers look too short. In these cases, a very slightly tapered leg may help. This could be done as an adjustment after buying an off-the-rack suit. Trousers are traditionally worn around your natural waist (between your belly button and the pelvic bones at your side just below). Wearing them higher will make the trousers longer and emphasise the length of your legs but break up your torso. High waistlines currently look a little old fashioned. Wearing trousers below the waist is a fashion call you'll have to make for yourself - many styles of jeans have 'low rise' fittings that will not reach your waistline without squeezing your crown jewels. If it works for you, fine. These guidelines are aimed mainly at tall slim men who want to avoid looking very tall and thin. If you are tall but also broad in the shoulders and chest, or in the stomach and waist, then the same advice will apply - but you may wish to do the opposite if you are trying to emphasise height rather than width. And finally . . . as with all style guidelines, breaking them can give you your own individual style, but it's good to know what the 'rules' are before you break them!